Millions of researchers, scholarly writers, students, and librarians use EndNote to search online bibliographic databases, organize their references, images and PDFs in any language, and create bibliographies and figure lists instantly. Instead of spending hours typing bibliographies, or using index cards to organize their references, they do it the easy way—by using EndNote! And EndNote Web is included with EndNote so you can collaborate with others easily. 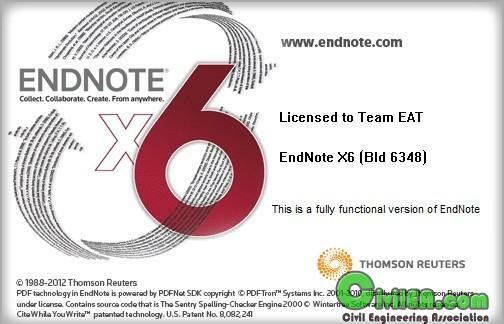 EndNote for Windows and Macintosh is a valuable all-in-one tool that integrates the following tasks into one program. • Watch the bibliography and figure list appear as you write! • Using EndNote's Connect...and Search... commands, you can search Internet databases just as easily as you can search your EndNote library on your computer. • Simply open any of more than 3,900 predefined connection files and you're online and searching. • Access hundreds of remote bibliographic databases, including Web of Science, Ovid, PubMed, the Library of Congress, and university card catalogs from EndNote. • Connect to data sources worldwide—EndNote provides MARC formats that support native language libraries around the world. • Search remote bibliographic databases using EndNote's simple search window—great for locating specific references. • Export references directly from Web of Science, Highwire Press, Ovid, OCLC, ProQuest and more. • Save and load search strategies at the click of a button. • Drag and drop references between EndNote libraries in one simple step. No additional importing required.